SPACES FOR CHANGE is collaborating with the Bartlett Development Planning Unit of the University College London (UCL-DPU) to conduct a research that aims to better understand how engagement between civil society groups and planners in Nigerian cities can protect the interests of the poor in the context of urban infrastructure development. . This research project is part of the ‘Urbanisation Research Nigeria’ (URN) programme, funded by the UK Department for International Development (DFID). There is a significant need for infrastructure development in Nigerian cities to meet the current, and future, needs of urban residents and of city economies.This includes facilities such as transport and water and sanitation infrastructure, and ‘new city’ developments, which tend to have significant land requirements. However, while necessary, the production of urban infrastructure can cause displacement in a variety of ways, which disproportionately affect low-income urban residents. Land acquisition for infrastructure sites often leads to the physical resettlement of residents on acquired sites. 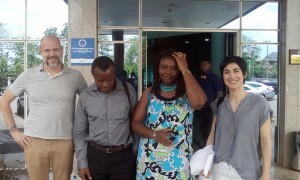 To kick-start this research, the coordinating team comprising Barbara Lipietz and Julian Walker (both of whom are Senior Lecturers of the UCL-DPU), Victoria Ohaeri of Spaces for Change and Dr. Victor Onyebueke of the Department of Urban Studies at University of Nigeria, Nsukka, Enugu State participated in an inception workshop in Enugu, Enugu State of Nigeria to develop the framework and research methodology, for both the national level scanning exercise and the case studies proposed under the assignment. Through these two major activities, the research will document the forms of urban infrastructure-induced displacement described above in Nigeria in general, as well as undertaking an in depth case study/ case studies of instances in which civil society groups and planners have successfully worked together to avoid or limit the displacement of the urban poor by infrastructure projects in specific cities. More specifically, we are identifying and profiling cases in which engagement between planners and urban residents affected by displacement appears to have had some measure of success in protecting the interests of more vulnerable groups of citizens, and exploring the governance and arrangements and citizens claims which gave rise to these successes. We want to understand what worked, how they did it and how to replicate those best practices across the board.